Hi Massimo, Can we draw an analogy between the decision-making process outlined above, and the discussion of role ethics previously? If we have different roles eg. partner and employee in the example above which are (temporarily) in conflict, we can resolve this by considering our supervening role as “human being” which includes the idea of pursuing Virtue. Or would the more contingent roles also include the same notion of Virtue so e.g. you could not really be a good partner if you were slack in your obligations to your employer? I’d like to hear Larry’s opinion about this, but yes, it seems to me like his discussion of superdination to adjudicate between conflicting norms is perfectly compatible with Johnson’s take on Epictetus’ role ethics. I’m stuck. If ” Norms — in this context — are simply facts about the behaviors of agents” and “Normative propositions, then, are representations of facts about norms”, then you as a stoic will direct your behaviour towards cultivating your virtue and someone else as a fundamentalist will direct his towards eliminating heresies, both of you when explaining your actions are correctly describing facts, and neither of you is more right or wrong than the other. I’m missing something pretty central; what? I think what’s missing in your description of the situation is the way in which the Stoic pursuit of Virtue arises developmentally from the process of “following the facts” – which we will get to in the next chapter. I think it is doubtful that the project of “eliminating heresies” will turn out to be equivalent to the pursuit of Stoic Virtue. But it certainly will turn out to be the case that Stoics pursuing Virtue will sometimes be pursuing significantly different intermediate projects that bring them into conflict with each other. More about that later, perhaps. So, something’s a “requirement” if there exists another “requirement” (or an ought, which is of lower hierarchical value) of sanctioning. I suppose the “requirement” of sanctioning can be “required” in the sense of (i) or (iii), but I’m a little uncomfortable with one of the key definitions looking like it involves circularity. Am I missing something, perhaps? I’d be curious to hear Larry’s take on this. However, note that “requirements” and “oughts,” in this classification, are not synonymous, the term refer to two different categories. As you say, “oughts” belong to lower hierarchical value of sanctioning, which I would think right there avoids the circularity. Also, circularity per se is not a bad thing, so long as it is not “vicious,” as philosophers say. 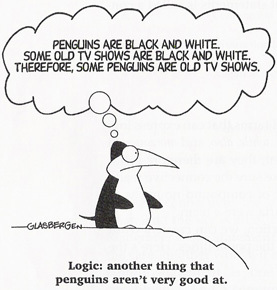 After all, the entirety of logic and mathematics are based on circularities, and yet they are very useful. I hope that helps. One of the things that introduces major complications into the sort of practical reasoning represented in stoic normative logic is that the meaning of terms like ought and requirement changes so dramatically given the variety of “levels” in which they are used. This complexity is in full flower in the Appendix, and if your questions about this matter remain, I suggest taking a look at that. It has not been changed in this new edition, and it is much more explicit about many matters than this brief Chapter 4. If I may change the subject: I hope you enjoy this weekend’s Stoicon in Toronto! Unlike last year, Fate isn’t permitting me to attend this year’s Stoicon. I hope to watch videos of the event. I just checked into the hotel! Hope to see you next year, Fate permitting. Hi. I didn’t understand what is here bridging the is-ought gap. What is here the “is”, what is here the “ought”, and what is here doing the bridging? The “is” is comprised by facts about human agents, their goals, needs, and desires. The “ought” is represented by the conditional imperatives (“if … then”) described in the OP. The bridge is created by the naturalistic view that morality is a human creation, meant to serve human needs — as opposed to something universally true like the laws of physics, or given to us by a god. I hope this helps.